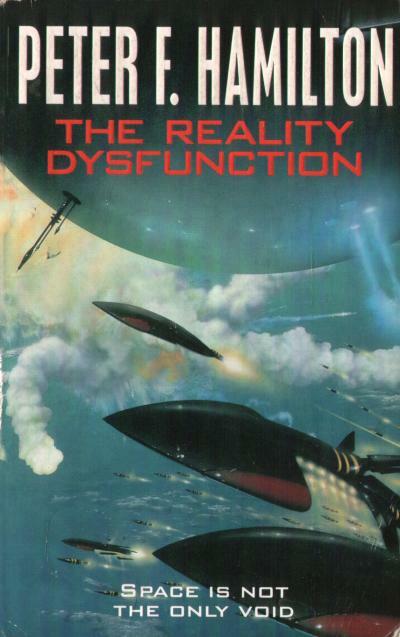 I read the first book, “The Reality Dysfunction” on a recommendation from a friend, and liked it enough to follow it up with the other two (“The Neutronium Alchemist” and “The Naked God”) in quick succession. And in a way that says it all really — for something just over a million words in length to be a page turner from start to finish is some achievement. As a result none of the negative comments below indicate major problems, really they’re just the bits that stuck in my mind as I read. With so many plot threads running in parallel, it was interesting to spot which ones held my interest the most and which ones didn’t, purely so that I could identify what made the good ones good and vice versa. It seemed to be the “big question” threads which made for the best read, i.e. the quests to find something or understand something. Dr Gilmore and his quest to understand the true nature of possession was in the first category (the lab scenes studying Jacqueline Couteur etc. being particularly good), as was the investigation into the Ruin Ring early on, then finally the quest to track down the Sleeping God — very compelling, real page-turner material. Threads such as the Rubra and Dariat story and Gerald Skibbow’s attempts to rescue his daughter were in the second category — well written, but didn’t really engage with me. 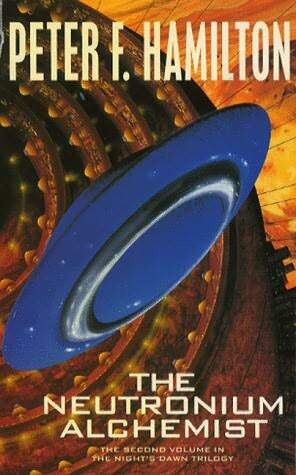 Night’s Dawn is more space opera than hard SF, but in amongst all the high-tech wizardry there seemed to be some distinctly soft SF elements which looked out of place given that they received very little explanation. An example is the affinity gene, a sort of telepathic link between people who have the right DNA strand in their chromosomes. The idea of telepathy being real isn’t a problem, nor the idea of it being genetically based, but in a technological society such as this, researchers would have been all over it as soon as it was discovered, trying to figure out the underlying physics. As a result, with affinity featuring so prominently in the story, there would be some mention of how it really works. As it is we’re shown a society that reacts with shock and disbelief when it’s revealed that people’s souls live on after death, but which has no problem swallowing the idea of spooky ESP with no explanation other than the fact it’s genetic. The obvious one is just the sheer scale of the thing, the galaxy-wide canvas, and the wonderful way this immense society is realised. The plot is similarly grand in scale, but somehow never becomes too complex or twisty to follow, and this is no mean feat. Among the specific ideas and events that really stuck in my mind are the scenes on Lalonde involving the Ivets in the first book, the ever-increasing depravity of Quinn Dexter as he descends into worse and worse atrocities, Alkad Mzu’s ingenious escape from Tranquillity, and the true nature (and eventual use) of her “Alchemist” doomsday weapon. Another part that really stood out for me was the liberation of Mortonridge, a vast land battle to reclaim just one part of one colonised world from the possessed. The way the participants know that such a titanic struggle can only ever be a symbolic victory for the humans is very well depicted, but still the fight goes ahead. I also liked the methods the human researchers came up with to defeat the possessed, including a kind of soul-eating machine that wipes a person’s soul out of existence altogether. It’s surprising just how chilling that prospect seems when it’s introduced, because that kind of total erasure is no different to what the characters in the book (and most of us reading it) thought death was all about anyway. It’s only because by this point in the story we’re used to the idea of souls living on after death that it has such an impact. Despite liking this trilogy so much, there are a few howlers that stand out. The whole Norfolk thing — it’s like that film “The Village”, where an old way of life is kept artificially preserved. It just doesn’t ring true. It’s explained later on that the planet’s colonisation was founded on a “pastoral constitution”, but that’s not enough to make this bit of the world-building believable. To me it read as if characters from a Jane Austen novel were busy fretting over when the next spaceplane would land with a delivery of tea and clotted cream. The idea that in 2600, Tottenham Court Road will still be the best place to go for electronics was another credibility stretch (as if 600 years ago it was the place to pick up a deal on an abacus). The armada storms ravaging the Earth leading to the construction of the arcologies: I liked this idea a lot, especially as the effect was given a very effective, very menacing name. Right up until the rather lame explanation is thrown in that some journalist, commenting on the possible role of the butterfly effect, said that it would take a “whole armada of butterflies” to make these storms. At that point the name lost some of its power. Al Capone: the story only just avoided descending into farce with the appearance of this drawling gun-toting gangster and his scheming girlfriend. However the idea that a sufficiently manipulative mind is equipped to rise to the top in any situation, no matter how far removed from the one it originally came from, is intriguing. Other cameos: the least said about these the better I think. When Elvis and Margaret Thatcher start appearing out of the beyond it all gets rather hard to take seriously, and only the fact that everything else had been so good kept me reading. Finally, the ending smacks of Deus Ex Machina (literally — God out of a Machine), and although I don’t have a problem with this in principle (after all, the quest for the true nature of the Tyrathcan God-being was one of the most compelling plot threads for me) I do think things were wrapped up slightly too neatly, a kind of Joshua Calvert wish machine. 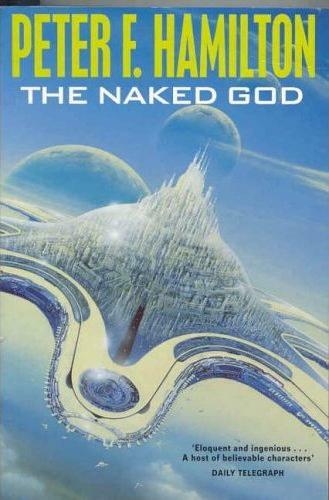 The Naked God was foreshadowed right back in book one, and I liked the way this odd little observation from the Tyrathca colonies on Lalonde came out of left field to provide the ultimate solution. All it needed was to be toned down a bit, less of a sweeping cure-all. Overall, the fact it kept me reading to the very end speaks volumes, and getting every single thread and idea nailed down and polished over a million word span would be some undertaking, so the fact that some questions remained is perhaps forgivable. I haven’t yet taken the plunge with any of his other works, but plan to before too long.